The Michelin Ginetta GT4 Supercup Championship made its way to the super fast Thruxton Circuit for rounds seven, eight and nine of the series. 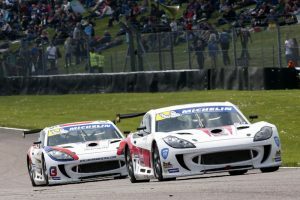 Big crowds and sunshine were the order of the weekend and right from the off the Century Motorsport duo of Tom Oliphant and Jamie Orton set about putting on a show with Oliphant taking a pair of Podiums along the way. Qualifying got underway on Saturday morning before two of the weekend’s three races taking place later that day. Tom Oliphant was the early pace setter toping the time sheets initially before taking the decision to pit after five laps and sit out the latter part of the session to preserve his tyres for the remainder of the weekend. By the session’s end, Tom would be classified in third position. 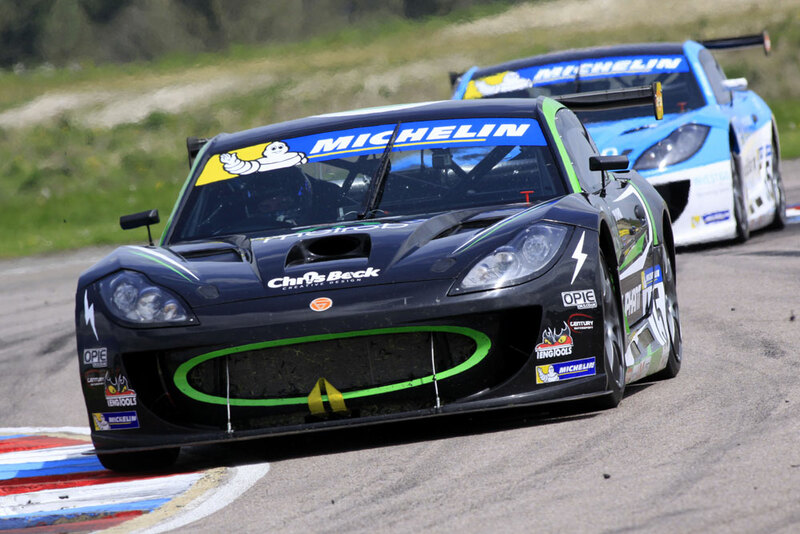 Jamie Orton had a steady session and put his Ginetta G55 in seventh position. The shorter of the two Saturday races got underway with Orton immediately moving up a spot to sixth place while Oliphant settled into third. Unfortunately in the frantic midfield battle Jamie got shuffled back to tenth by the end of lap three but he quickly got his head down to make his way back up the order passing Woodhead at the Chicane followed by Luke Davenport to put him eighth where he would remain for the rest of the race. Meanwhile Tom was coming under pressure from Andrew Watson but some clever defending would allow him to hold onto his third place and make his first visit to the podium of the weekend. 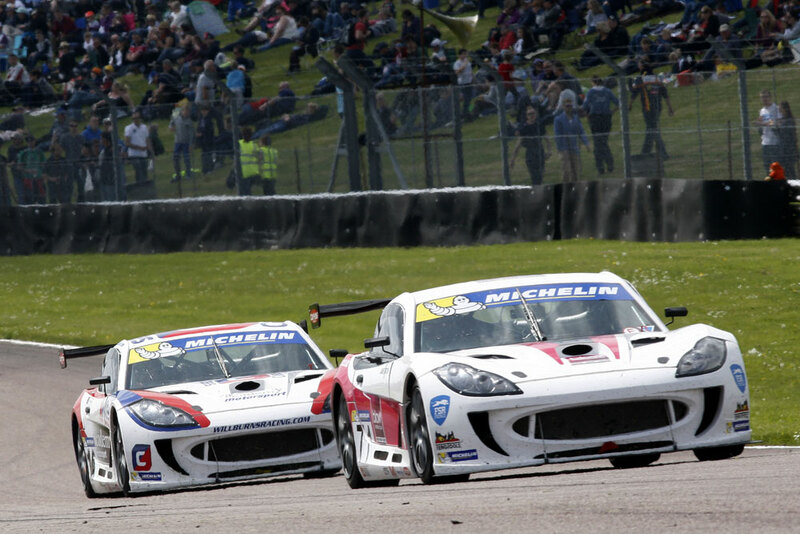 Round eight of the championship closed out the racing for the day at the Hampshire circuit. Starting in their finishing positions from the earlier race, Tom Oliphant lined up in third with Jamie Orton in eighth. Both drivers lost places at the start with Oliphant slotting into fourth behind championship rival Watson, while Orton fell to tenth. As in race one, Jamie set about making his way back up the order quickly moving ahead of Davenport and closing in on the tail of the battle for fifth. Unable to find a way through, Jamie was forced to settle for ninth at the chequered flag. Tom was eager to repeat his earlier visit to the podium and after a number of attempts to pass Watson he finally found a way past going through Cobb on lap ten and instantly started to pull away to close in on the second place man, Carl Breeze. Laps however ran out before Oliphant would find a way past the experienced Ginetta racer and Tom came home to secure is second podium of the day in another fine third place. Top four reversed was the result of the draw for the race three grid meaning Oliphant would start on the front row in second with Orton ninth. A rapid start from Jamie promoted him ahead of Will Burns and Pepe Massot to seventh but Tom was not so lucky as he dropped to fourth behind Breeze and David Pittard on the opening lap. As the race progressed it was Jamie who continued to move forward and found a way past Charlie Robertson in the closing laps promoting him to sixth. Tom Oliphant had his sights set on getting on the podium once again but while battling a struggling Breeze, he was forced wide at the chicane dropping him down the order briefly before working his way past team mate Orton followed by Breeze to end the race in fourth to further secure his strong position in the championship standings.